How many of you have suffered from stress at some point; that feeling that things are out of control? You might be overwhelmed with work, or have a poor relationship with your boss, your children or your significant other. We have all been there. The world is moving all around us. Situations are occurring and relationships are evolving all the time. You may think that the situations or circumstances around us are creating our stress but I challenge this. What actually creates the stress we feel is what happens when we take the situation into our head. It is the stories we tell ourselves about the situation or relationship that creates the stress. What are the conversations you are having with yourself and how do those conversations affect you? How many of those conversations are positive and how many of them are negative? How many of them make you feel good and move you forward? How many of them hold you back and don’t make you feel good? Are the majority of the thoughts in your head positive and energize you or are they negative and potentially disempower you? The figure above is “The Pathway to Wellbeing.” The thoughts and conversations we have in our head have a direct impact on how we feel and those thoughts affect our feelings. The feelings we have create emotions. Our emotions result in certain behaviours. Our behaviours affect our actions and our actions create our outcomes. 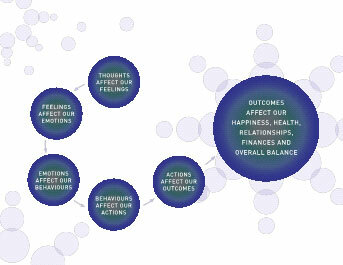 The dots connect from the thoughts and feelings we have to the outcomes we create. Spiritually aligned leadership is about intentionally choosing thoughts that create great feelings. You begin by becoming the observer of your thoughts and feelings. As you observe, you reflect and make different choices about what you think about. Every one of us has control over what we think about and the resulting feelings that those thoughts produce. The problem is that many of us are on autopilot. We are unconsciously letting our thoughts run and we react to life’s situations without being aware of the thoughts running in the background. Spiritually aligned leadership is about becoming more conscious, intentional and deliberate in everything we do and, most importantly, monitoring the conversations we have with ourselves and the resulting feelings that are created. Let’s take a difficult or poor relationship with a colleague as an example. We have negative thoughts (a sense of being wronged or misunderstood) then we have a minor setback and more negative thoughts (I just don’t know what is wrong with my co-worker — they just don’t get me). The feelings (frustration, confusion, misunderstanding) this thinking creates are negative, which evoke negative emotions (sadness, anger, victim mentality) and then our behaviors (impulsive, unconscious) are affected creating our actions (negative energy in meetings, lack of collaboration or cooperation) and result in poor outcomes (increased stress and strained relationship). The thoughts we have are the critical starting place for change, but it is the feelings and resulting emotions that have the most significant impact. It is not about being a positive thinker; it is about going to the next level and feeling what it will be like to have a healthy relationship. You have to move from thinking and feeling misunderstood and frustrated to seeking the good in the other person. It is the story you tell yourself that matters. It is what you say to yourself about this colleague, and the subsequent feelings you have, that are creating stress and unrest. Let’s compare the above story to this one. You make the decision that you want to feel better about this relationship. You make the decision that you only have control over what you think about and you decide that you want to have better feeling thoughts. You know that the thoughts you are currently having do not support what you really want. So you begin to shift what you think about. You make the decision to make a list of all the good qualities this person has, all the things they do really well. You decide that you will journal every night about what they do well and how they contribute to the organization and team. You will begin a gratitude journal where you record all the things you like about your work and your employer. You imagine how great it will feel to have a fabulous day that includes open honest communication with your colleague. You begin to imagine the relief you will feel when your attitude changes towards this person. You take small steps like deciding that you will not react to situations from an autopilot perspective but will slow down and consider how you want to be at work while interacting with this person. You decide you will be open to seeing the good in this colleague. Individual employees, managers, supervisors and teams get immediate relief when they practice the Pathway to Wellbeing. They gain a balanced perspective of the situation and their stress reduces immediately. Yvonne Thompson, MA. CHRP is the found and CEO of Change Innovators Inc. a company that specializes in building Spiritually Aligned Leadership programs for corporations and are the founders and creators of the nationally acclaimed Creating Positive Energy workshops across Western Canada.